When I was planning the Shop Local Holiday Guide the absolute very first thing I thought of featuring was Rosebud CBD. Rosebud is not only a local company, but the packaging is GORGEOUS, and the founder, Alexis Rosenbaum, also knows her stuff. The Instagram feed isn't just filled with beautiful images, but facts too. Because the oil is a product of Cannabis plant there are a lot of opinions and beliefs (and what your mom thinks) floating around, but Alexis and her company have really become a fountain of knowledge on the subject. Cannabidiol (CBD) is the most prevalent cannabinoid found in the cannabis plant. It’s history in medicine dates back to prehistory. It has long been pushed aside while scientists and users focused on the mind-altering component, THC. CBD has been known to reduce anxiety and stress, inflammation and pain; as well as topical ailments like psoriasis, acne and eczema. CBD is a wonderful natural anxiety solution, and has become my number one reason for use. I’ve also added it to some coconut oil to topically help the eczema I get on my legs during the winter. It has a number of other wonderful benefits, but because the lack of regulation there are a lot of lesser CBD products on the market. 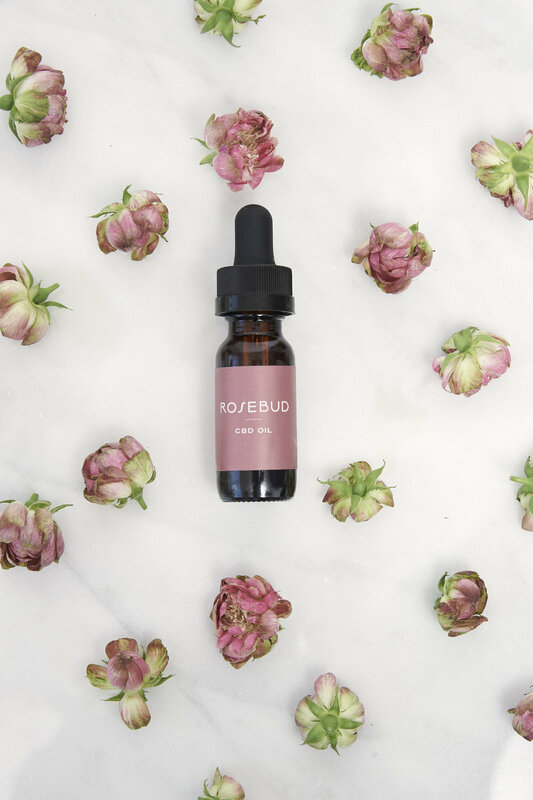 Rosebud CBD is grown and processed in Oregon, one of only 4 States in the US that actually regulates and certifies the products made from Cannabis. I’m not going to go on about CBD because I’m not the expert, nor am I well-versed enough in the subject to educate anyone. Instead I suggest you head over to the Rosebud CBD site here to get all the information you need. What I can tell you is that I believe in the use of Cannabis, CBD and Rosebud CBD for myself. Back to the Holidays, because as they say, they’re the most WONDERFUL time of the year. But maybe they’re not. The Holidays are a time of stress and anxiety, between entertaining, attending events, buying gifts and dealing with family. This Holiday season I’m saying f**k that noise. Instead, together with Rosebud CBD, we headed over to Hudson Table in Hoboken— an open kitchen where you can eat expertly made meals by different chefs, or get hands on experience learning to make meals yourself. Lead by Resident Chef Instructor Angie Marin, who has a background in Cannabis infused cooking, we learned how to make these amazing Rosebud CBD Infused Pumpkin and Maple Cookies. See the recipe below if you’re interested in making yourself a sweet, and calming holiday treat. Preheat oven to 350 degrees F. Line a large sheet tray with parchment paper or a silicone baking mat. Set aside. Whisk together the flour, baking soda, spices, and salt in a medium bowl. Set aside. In the bowl of a stand mixer, beat butter, brown sugar and granulated sugar until light and fluffy, about 3 minutes. Add egg, vanilla extract, and CBD oil. Beat until combined. Beat in the pumpkin and maple syrup until smooth. Gradually add half of the flour mixture, scrape sides down and add the remaining flour. Being careful not to overmix, you want to just get to the point where you don’t see any remaining dry flour. Stir in the oats. Drop cookie dough by rounded tablespoons onto prepared baking sheet. If you’d like flatter cookies, dip finger into small amount of water or oil and just lightly press the cookies down a bit. Bake cookies for 12 minutes or until cookies are lightly browned. Cool on baking sheets for 2 minutes; transfer to wire racks to cool completely. While the cookies are cooling, make the glaze. In a medium bowl, whisk together melted butter, powdered sugar, maple syrup, vanilla extract, milk, and CBD oil (if using). Whisk until smooth. The more milk you add the thinner the glaze will be. Depends on your preference. I like a thicker glaze! Drizzle maple glaze over cooled cookies. If you can resist, let sit until glaze hardens. For more information on Rosebud CBD check out their website here, and their Instagram here. And don’t forget to check out Hudson Table here and Angie Marin here. And lastly, HAPPY THANKSGIVING, FRIENDS! I've known I wanted to do a Shop Local Gift Guide when I started HudsonCounty60, but I didn't know how to kick it all off. But what better than a little party? For me, the Holiday's are synonymous with parties and get-togethers. There are the Holiday basics for the Christians of America-- Thanksgiving, Christmas and New Years-- but what about all the celebrations for all the other religions and groups of people that make up our great community? There's Diwali, Channukah, and Kawanza. I knew I needed to keep the Holiday vague, in hopes of throwing a party viewers would want to throw themselves, and I also wanted to do something that would include HudCo60 All Stars like Jen Choi of Sugarsuckle, and Casey Repetti of Casey2Cook. Booze was obviously another requirement. In September, maybe even August, I started reaching out and beginning the planning process. Both ladies would help me prepare something for the party. Jen decided on Linzer Cookies, which were perfectly light and delicious, and still maintained that holiday spice we all know and love. Casey decided on the perfect party appetizer; sausage, pepper & onion bites. These are not only delicious, but they can be made significantly in advance and frozen, and are INCREDIBLY economical-- one recipe yields 46 bites, and I think we all can agree parties get expensive. Lastly, I approached the fairly new Wine Dad's in Hoboken about alcohol. I assumed they would suggest some local breweries, but did me one even better-- The Bibo, which may be the perfect little machine for a party. Have you ever thrown a party with a specialty cocktail, only to have to keep making pitchers and pitchers all night long? With Bibo, you essentially have an at home bartender that everyone can work on their own. The machine is as simple as can be-- open the top, put one alcohol packet and one cocktail mix packet in, press the 'mix' button and in less than 30 seconds you have a cocktail! Add a little ice and garnish of choice and voila! But what makes the Bibo truly perfect for the HudsonCounty60 Shop Local holiday gift guide is that the company is based in Clinton, NJ. And the alcohol pouches? All made by Claremont Distillery in Fairfield, making it New Jersey's largest craft distillery— their Spirits are all produced in the “Garden State” using the finest locally sourced ingredients. So how does Wine Dad's come in? They're the only place in Hudson County that's your one stop shop for the Bibo machine, and alcohol pouches. And a little holiday tip for you— not only are we giving away one machine (valued at $199) to a lucky follower, but during Black Friday you can score one of your very own for only $99 at Wine Dads... wink, wink. All that was left to do was enjoy! Luckily for me, the party was small and entirely manageable. Between Casey, Jen, Gretchen from Wine Dads and Cait Kolibas from Bum Pilates, we had a great group of ladies! To throw a Holiday Party like ours on your own, I've included Jen and Casey's recipes below. Don't forget to follow all of our friends and vendors on Instagram (links at the bottom) for their Holiday tips! 1. Whisk all dry ingredients together in a bowl (other than the mixing bowl for the stand mixer). 2. In the stand mixer, beat butter and sugar until light and fluffy. Scrape down to sides of the bowl to make sure butter and sugar are completely combined. 3. Mix egg and water in a separate bowl. Slowly add to your butter-sugar mixture while the mixer is on a low speed. 4. Once the egg/water and butter/sugar are completed incorporated, turn off your mixer and add all of the dry ingredients. Turn the mixer on a low speed to combine. Once the dough comes together, stop the mixer. Divide the dough in half and wrap each section in plastic wrap. Chill the dough 1 hour before rolling out. 5. Roll out the dough to 1/4 inches thick between parchment paper to prevent sticking. Use cookie cutters to cut out shapes and place on a cookie sheet or sheet pan lined with a baking mat or parchment paper. 6. Bake at 350 until the edges are golden. Allow cookies to cool completely before adding preserves/jam. This recipe yields approximately 25 sandwich cookies. Cookies can be stored at room temperature in an airtight container for up to 3 days. 1. In a medium bowl, remove the sausage from the casing.. combine the sausage (I used hot) salt, pepper, garlic and egg with your hands until blended. 2. Remove one sheet off puff pastry and unfold it. It is usually folded like a letter, in three. Use the natural bends to cut the 1 sheet into 3 sheets. Roll out each one to about double in size. 3. Divide the sausage mixture into 3 even amounts. Fill each piece of puff pastry and roll into a long log. Use water on your fingertips to seal the puff pastry. Roll in parchment and freeze for at least 1 hour. 4. Remove from the freezer, slice into 1/2inch rounds. Brush the outside with melted butter. 5. Place them at least a half-inch apart on an oven safe tray lined with parchment and bake for 20 minutes or until golden brown and cooked through. This recipe will make 3 dozen bites! …DON’T FORGET TO FOLLOW OUR FRIENDS ON INSTAGRAM FOR HOLIDAY TIPS AND INFORMATION! WARNING: I love steak. I really do. Steak in my opinion, like a good cup of coffee or a nice bourbon - needs nothing, you should just be able to enjoy it as is. But I have never been to Dino & Harry’s Steakhouse. Ever. Growing up in Hoboken, I’m very familiar with what an institution it is. I even remember past incarnations of the Steakhouse. But somehow I’ve just never been. So when Jane Estes, owner of Engle & Völkers Hoboken pitched the feature idea, I was into it. SanMartin and I head to E&V offices and I’m ready for steak. I’m dying to find out if it’s as great as everyone says. The Engle & Völkers office is beautiful and shiny and new. We head out the backyard space where Dino himself and Sharon, who handles marketing for D&H and is also a realtor at E&V, are getting the grill going. 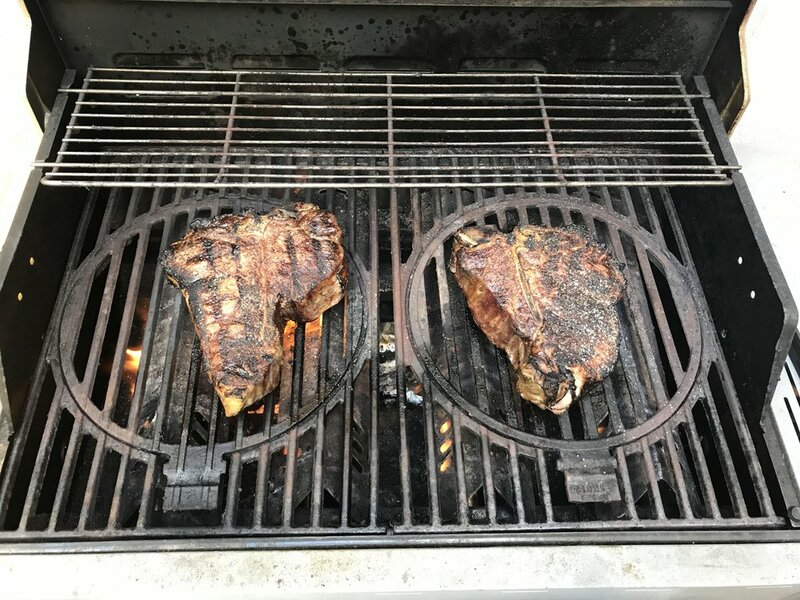 There are two beautifully fat 32 ounce porterhouse steaks getting the D&S house seasoning treatment and then thrown onto the grill. The time has finally arrived - they’re done cooking, Dino has cut into them and we’re about to chow down. The steaks are cooked perfectly, in little time and are the kind of meat that melts on your tongue. I add some D&H steak sauce because it’s their signature sauce and I feel I need the whole experience. While the sauce is good, the steak doesn’t need it. Its absolutely delicious. When Sharon and I sit down for our interview we talk about the best meal to order, the history of the establishment and the fact the steaks are now available to order online to cook at home. Just in case you were wondering what the best meal is, Sharon says steak with mashed potatoes and creamed spinach with one of the bottles of wine off their insane wine list, but that’s met with some conflict as Jane says the lamb chops are the most amazing thing. I think you can’t go wrong with either choice. Next I sit down with Jane to talk about Engle & Völkers. A long time resident of Hudson County (and my neighbor for almost 20 years), I ask her why she thought to bring an E&V to Hoboken, to which she explains that with so many people moving over from the city, Hudson County is truly the 6th borough with many people looking for luxury homes. E&V is known as a luxury lifestyle agency, and Hudson County is rapidly moving that direction. We also discuss their annual Cystic Fibrosis Halloween Gala in honor of her late business partner Nick Constantino which is catered by 10 businesses including, you guessed it, Dino and Harry’s. My time at Engle & Völkers was so lovely, we had amazing food and ended the way I like all hectic days to end— with a nice glass of wine outside. I can’t wait to get the full Dino’s experience and get to-go steaks perfect for Thanksgiving or Christmas Eve at my house. And don’t worry SanMartin, I think I found where we’re having our own little Holiday Party! 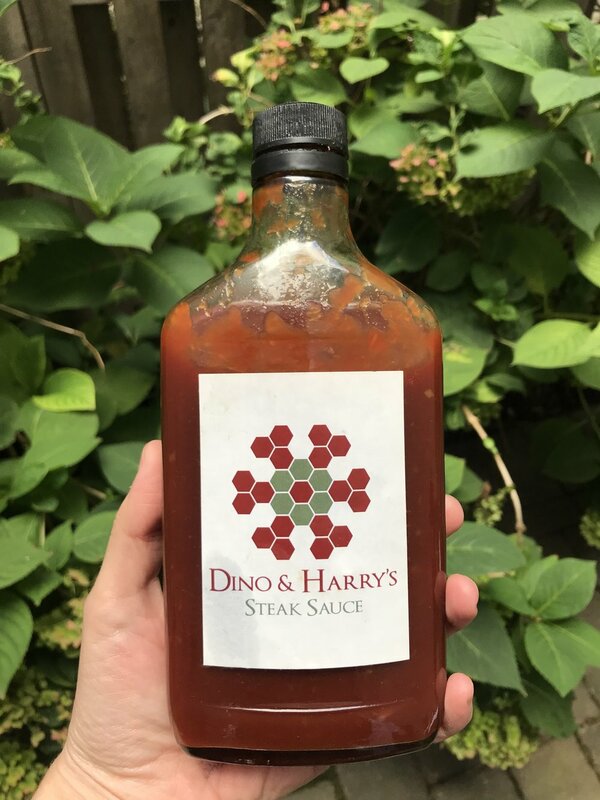 For more information on Dino & Harry’s Steakhouse, check out their website here and their Instagram here, as well as Engle & Völkers Hoboken here and here.